The America the Beautiful Quarters series begins in the year 2010. After eleven years of rotating designs presented through the prior State Quarters series and DC & US Territories Quarters series, collectors have become familiar with the process. There will be five different reverse designs issued during the year, featuring a unique scene or representation of a National Park or site. The order that the sites will be presented was determined based on the order the sites were federally designated. Because of this special ordering, the US Mint had to select the sites to be featured for all 56 quarter before the start of the series. The site register forms a road map for the rest of the series. 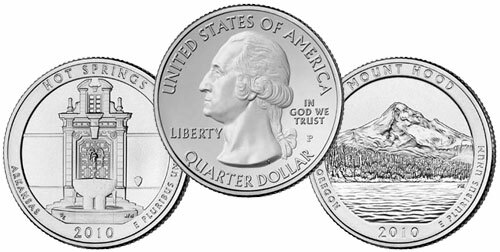 An interesting aspect of the releases for the inaugural year involves the Hot Springs Quarter and the Yellowstone Quarter. Even though Yellowstone is referred to as America’s first National Park, Hot Springs was established as a reservation under federal control in 1832, which predates the establishment of Yellowstone. Also notable, the state of Arizona, which was one of the last coin issued in the State Quarters series, will be one of the first coins issued in the new series. For both series, the coin features the Grand Canyon. The first America the Beautiful Quarter featuring Hot Springs National Park was released on April 19, 2010. The remaining releases for the year follow in roughly equal intervals.